You are a survivor of a zombie apocalypse and you're stuck on a house with a useless car and hordes of zombies attacking from the lawn. But wait, you found a tool enough to fix the car to escape the hordes of zombies. ARE YOU READY FOR IT? 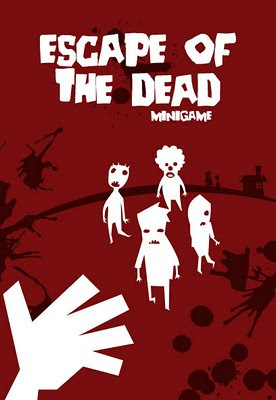 In the game you are trying to fix the car while defending yourself against hordes of zombies. You're given 4 Action dice per turn, distribute between 3 sections of the game (either by shooting zombie, fixing the barricade and/or fixing the car). Roll for success on each section. Any zombie that survived will attack the barricade. When you successfully killed 10 zombies you will be rewarded with power-up. You lose when your barricade is down (i.e barricade's hp equals zero). You win when the car is fixed 100%. You need 4 six sided-dice, a pencil and an eraser for book keeping. Thanks to a podcast I recently discover your blog and the Spanish version of this game. We do hope that you had fun playing it! Thank you for this game. I just played to the french version. It seems unbalanced (too many zombies and low probability to fix the car. To win, maybe we have to just place all our dices on the zombies and get lucky until kill 10 zombies - to often reach the reward; but it's a bit repetitive...). In this game, we have to get lucky with the dices. Maybe too many zombies appears too quickly, or we would need to get +1 dice when we reach 70 or 80% of the car. Then, that's really a shame the file is pixelised, because illustrations are really cool! I appreciate the fact that this is a game on 1 page, and the game layout is intuitive, bravo! A quick and fun game, just a bit exasperating because that's not easy when dices are against us.